Stop stressing about spelling and grammar in your college essays and papers. I am so excited to share with you one of my favorite tools to help write college papers, blog posts, even just your Facebook updates. Now, it doesn’t do the work of writing for you, but Grammarly is an amazing tool to easily check your grammar and spelling. But what if you aren’t writing in Word? How do check your spelling and grammar when you are writing online, like posting to an online course’s discussion board? Starting now, you should rely on Grammarly to write college papers, essays, and other assignments like a pro. The best news? It is totally free to use their basic plan and the free plan offers a lot of value. I use it daily to ensure I’m not posting mistakes on this blog or social media. If you need some help planning out when and how to sit down and start writing, check out my tips on how to study less and grab your free PDF study planner to make planning your writing sessions a breeze. Write in 3rd person. This means skipping references like “I think” or “I believe”. You’re writing the paper. It is already implied that these are your thoughts. Start with an outline. Have a point and connect the dots from start-to-finish before you ever begin writing. Always check your spelling and grammar. These little mistakes can knock you down a grade point but are easy to avoid using Grammarly. Read your paper out loud, or find a friend to read it out loud to you. Hearing your writing can help you identify an explanation which isn’t quite right or confusing wording. Worried your citations are verging on plagiarism? 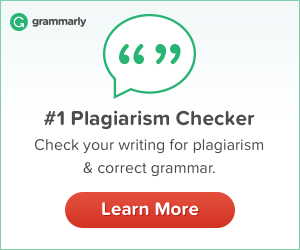 Don’t stress because Grammarly has you covered with their plagiarism checker. Please note: some of the links on this page are affiliate links. There is no cost to you to use these links and Grammarly can be used for free, but I may get a few cents if you decide to use their service.